In recent years sensors stationed across the North Atlantic have picked up a potentially concerning signal: The grand northward progression of water along North America that moves heat from the tropics toward the Arctic has been sluggish. If that languidness continues and deepens, it could usher in drastic changes in sea level and weather around the ocean basin. That northward flow is a key part of the larger circulation of water, heat and nutrients around the world’s oceans. Climate scientists have been concerned since the 1980s that rising global temperatures could throw a wrench in the conveyor belt–like system, with possibly stark climatic consequences. Sea levels could ratchet upward along the U.S. east coast, key fisheries could be devastated by spiking water temperatures and weather patterns over Europe could be altered. Such concerns had been quelled over the last decade as climate models suggested this branch of the ocean’s circulatory system was not likely to see a rapid slowdown, which would slow any consequences. But two new studies, published Wednesday in the journal Nature, suggest the recent weakening spotted by ocean sensors is not just a short-term blip, as some had thought. Rather, it is part of a longer-term decline that has put the circulation at its weakest state in centuries. The results imply climate models are missing key pieces of the puzzle, and that ill effects could be on their way. Which pieces might be missing, though, could determine how worrying this trend is. If models are not sensitive enough to the changes going on in the North Atlantic, “that sort of puts the warning flag a little higher,” says Thomas Delworth, an ocean and climate modeler at the National Oceanic and Atmospheric Administration who was not involved in the research. The warm, salty waters of the tropical Atlantic cruise northward along the eastern U.S. before darting toward northwestern Europe (giving the British Isles a climate far balmier than Newfoundland at a similar latitude). 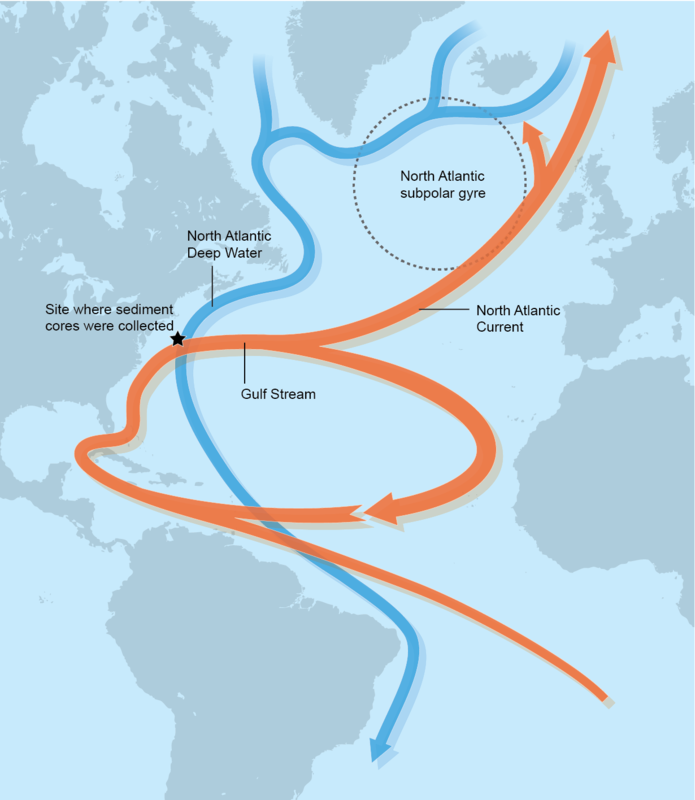 As that segment of ocean flow, known as the Gulf Stream, pushes north, it cools and becomes denser and eventually sinks, forming the so-called deepwater that flows back southward along the ocean floor toward Antarctica. This cycle, called the Atlantic Meridional Overturning Circulation (AMOC), plays a key role in moving heat around the planet as well as nutrients throughout the ocean. It also helps draw carbon dioxide from the atmosphere into the sea. In the Pacific Ocean equatorial heat is transported north and south toward both poles. But in the Atlantic “the heat is moving northward throughout the whole Atlantic Ocean,” says David Thornalley, a paleo-oceanographer at University College London and co-author of one of the new studies. The resulting heat imbalance between the Northern and Southern hemispheres determines several large climatic features, such as the latitude at which a key tropical rain belt is located, which impacts water supplies, precipitation for agriculture and the health of tropical ecosystems. As global temperatures rise with the levels of heat-trapping gases in the atmosphere, the AMOC could be disrupted by an influx of freshwater from increasing precipitation in the North Atlantic and the melting of sea ice and glaciers on land. The added freshwater lowers the water density in the zone where deepwater forms, backing up and weakening the overall flow of the AMOC like a clogged sink. That slowdown means less heat is transported northward, leading to cooler ocean temperatures in a region below Greenland, and warmer temperatures off the U.S. east coast. That warming leads to higher sea levels along the coast and raises sea temperatures where economically valuable cold-loving species like cod and lobster live. There are some indications the cold spot below Greenland can alter atmospheric patterns in a way that channels warm air over Europe, increasing the likelihood of sustained summer heat waves, says Levke Caesar, a PhD student at the Potsdam Institute for Climate Impact Research (PIK) and co-author of the other new study. The changing ocean temperatures from an AMOC slowdown could also potentially help lock in colder winter conditions over the eastern U.S., PIK’s Stefan Rahmstorf, a co-author of the same research, has posited, although the evidence there is not clear. Until a little more than 10 years ago scientists did not have any direct measurements of the AMOC to see how it was actually responding to climate change. The deployment of the RAPID array of instruments (short for the U.K and U.S.–sponsored Rapid Climate Change program) across the Atlantic Basin has allowed that data to slowly trickle in, and “they’ve been revealing it is undergoing weakening,” Thornalley says. But the brief window of data offers no longer-term perspective. When that first data came in, scientists thought the weakening could be a temporary change resulting from the natural ups and downs of the climate, but were aware it could be part of a much longer decline. To help resolve the uncertainty, the teams involved with the new studies turned to what are called paleoclimate markers, which capture past changes in Earth’s climate to see how these recent changes fit in. Thornalley and his colleagues used sediment cores collected from the ocean floor along the U.S. east coast to reveal how deep ocean currents linked to the AMOC have changed over time; stronger currents deposit larger grains of sediment. They also looked at tiny creatures fossilized in sediment cores—some of which had thrived in colder conditions, others in warmer ones—to see how ocean temperatures changed as the AMOC waxed and waned in strength. Caesar and Rahmstorf’s study used direct measurements of ocean temperatures going back to the late 19th century. The studies differ on the timing of when that weakening began. Thornalley’s record, which spans those 1,600 years, suggests it started at the end of the little ice age, a period from about A.D. 1350 to 1850, when solar and volcanic influences depressed temperatures across the Northern Hemisphere and glaciers and ice sheets expanded. As the little ice age ended and temperatures warmed, ice melted and freshwater flooded into the North Atlantic. The results suggest the current state of the AMOC is the weakest it has been over that whole long record. Whether today’s state is just a continuation of that reaction or whether global warming has also started to chip in is not clear, he says. Caesar, meanwhile, put the turning point toward a weaker AMOC in the mid-20th century, suggesting it is due to the influence of human-caused warming. Her team’s record, however, does not extend as far back. The two results are not mutually exclusive. Both records show broadly similar patterns in decline. “We think it’s quite remarkable that all the evidence is converging,” Thornalley says. But pinpointing the timing of the weakening trend would give better clues as to what is driving it as well as how quickly it is happening and how rapidly we might expect to see some of the resulting climate impacts. Already, Thornalley says, it is clear the Gulf of Maine has its warmest temperatures in the last 1,600 years. There are also “tantalizing glimpses” of more rapid sea level rise along the U.S., he says. The researchers are curious why climate models seem to be missing something in the AMOC process. They do not capture this past behavior and significant weakening. If the results of these studies bear out, Delworth says, it is possible the models are not sensitive enough to the changes in ocean freshwater that are happening or they are not factoring in all of the important changes that have impacted the circulation. A 2017 study that looked at what would happen if climate models did factor in that melt saw it caused a sharper response from the AMOC than had otherwise been suggested. Moving forward, the RAPID instruments will slowly help tease out the AMOC’s behavior. “It’s just that we have to wait a couple of years,” Caesar says, by which time some impacts may already be happening.